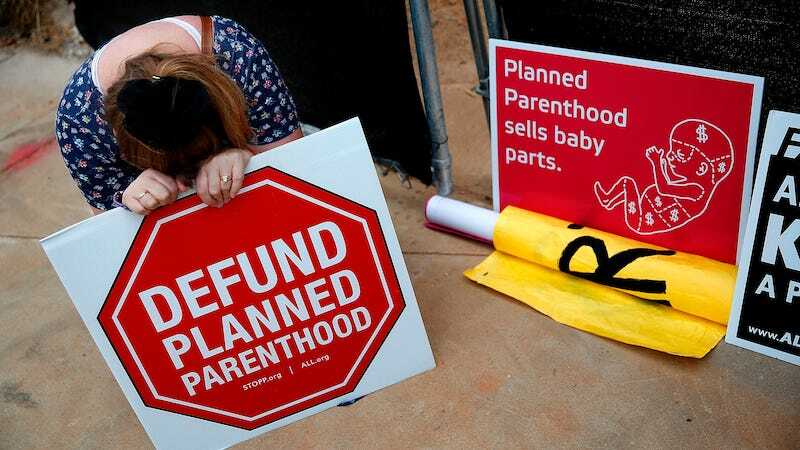 The fate of Planned Parenthood has been in the hands of irritable men and a few irritable women as congressional Republicans continue to push for its defunding, most recently threatening a government shutdown. However, the gang here at the Values Voter Summit in Washington D.C. is not stressed about it — the question for them is not whether PPFA will be defunded or not; it’s when. On the second real day of VVS, I decided to attend a panel called “The Landscape of a Post-Planned Parenthood Future,” to see how few medical choices I will be able to make in five or 10 years. The panel was held in a basement conference room with unnervingly low ceilings, and I was the only member of the press in the 50-something person crowd. While the panel never touched on what the country will look like once the women’s healthcare provider eventually falls, it did provide a brief overview regarding how they planned to topple it. On the dais were some heavy hitters from the pro-life community: Chuck Donovan, the president of the Charlotte Lozier Institute, a pro-life research organization, Arina Grossu, director of the Center for Human Dignity at FRC, and Lila Rose, a pro-life activist and founder of Live Action, known for investigating PPFA and the “evils of the abortion industry.” Grossu and Rose chose to wear pink because they are “reclaiming” the color. “It’s a powerful and amazing time for people in our movement,” opened Rose, referring to PPFA as “the biggest abortion chain in this country.” The release of the “investigative” videos this summer had “rocked the conscience of the country” and had created an opening to start conversations about how terrible abortions actually are. “All of a sudden people were given an encounter with the humanity of the child,” she said. The main thrust of Rose’s short presentation was that PPFA isn’t your average nonprofit — rather, it has become entrenched in Democratic party politics. Cecile Richards and Barack Obama are best friends, she said. Richards has visited the White House like 39 times. Rose then showed a “stealth viral campaign” video that has been viewed over 10 million times on Facebook, that she says can “quietly” influence viewers to change their opinion about abortion. The video was anything but quiet. It showed a series of images of dying pre-term babies spliced with undercover footage of a woman discussing abortion with various doctors — at the interviewer’s goading, one man referred to the baby as similar to “meat in a crockpot.” At the conclusion, the video showed healthy babies and toddlers who had been born pre-term accompanied by gentle music. When the lights came up, half the audience was crying. When Grossu spoke, she focused on the services that PPFA ostensibly offers (STD/STI testing, cancer screenings, contraception, etc.). The truth, she argued, is that these services have decreased dramatically in the past 7 years — all except abortion. The alternative is to give tax money to “Broad-Spectrum Health Clinics” — centers that are so great because they help women but they also help children and men. One of her slides outlined all the stuff these clinics do in comparison to PPFA’s relatively few offerings. Grossu actually just listed services any general practitioner’s office would offer. Donovan used his time to speak about states and how they can work to get out of various kinds of funding that goes to PPFA. One way is through grants and contracts, while the bulk is through the Medicaid program which can get “tricky.” He praised Michigan, Arizona and Ohio for combatting the first category, while Alabama, Arkansas, Indiana, Louisiana, New Hampshire and Wisconsin have pushed to suspend Medicaid provider agreements with PPFA. “Our side needs to be careful, master the arguments and master the facts and show that women’s health does not need abortions to be successful,” He concluded. Ultimately, the panel was not a shocking foray into enemy territory— none of the information presented was different from what is readily available. But what VVS has taught me more than anything is that the same wrong information presented in a room full of people who believe it can actually be quite compelling.